This was our very first tube trial. Since then we now use another type of cup with more holes to help with aeration, water consumption and allows the roots to grow freely. We also managed to perfect the hole process without cracking the PVC pipe. A first look at our green house, before it could be a green house. We removed the side walls and insulation in order to install clear plastic walls instead to allow light and heat to make it's way inside. Front to back of the green house. 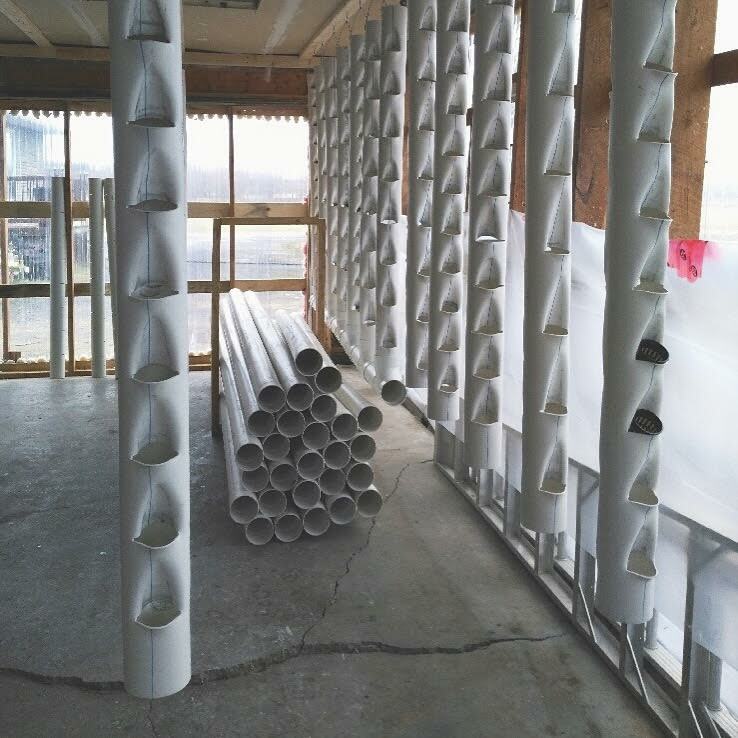 We started installing the rows of PVC pipes and connecting the bottom pipes in order to connect each PVC pipe to each other. The making of the PVC pipe: A heater, a home-made wooden base, an aluminium baseball bat and some cold water to cool the baseball bat between each hole process. From back to front of the green house. Here you can see the startup of the barrels we use to filter the fish water. The clear walls and the making of the holes in the PVC pipes and finally connecting the PVC pipes. Trying out our new innovative cup with the vermiculite soil and coconut fiber, sitting on dried coconut filament. A NEW system added to the family to add extra room for the plants that can't grow in our tubing system. Our filter system all connected together. A DUO installed on top of the pure filtered water, in order to continue keeping the water full of minerals and ecological, the water releases itself back into the tank and re-fills itself creating a constant ecosystem. Hope you enjoyed OUR Growth. We always welcome those who are further interested in the connections, the process and the growth of the produce itself. Visit our location or contact us by clicking the Button below.